Dermal Filler is the procedure which is specially done on the face for the treatments of wrinkles and facial contour causes. It is done to fill out your skin to make it smooth and beautiful. A Dermal Fillers Treatment helps you in many ways to make your face look attractive. It is a medical treatment done with a special procedure in which your skin is injected with an ultra-fine needle. This process is done by the well qualified plastic surgeons and dermatologists. At Sakhiya Clinic, you find an apt Dermal Fillers Treatment in Mumbai as we only associate with the doctors and nurses who are well trained and have hands-on experience. This treatment is adopted by many people and it quite common nowadays. Dermal Filler treatment is done to replenishes skin and make it appear smooth. This skin treatment helps in reducing the wrinkles and lines of the skin which gives you a youthful appearance. You will get many benefits with the long-lasting results with it like shaped up lips, wrinkles and lines free face, change the contours of jaw and lips and lines around eyes and mouth. 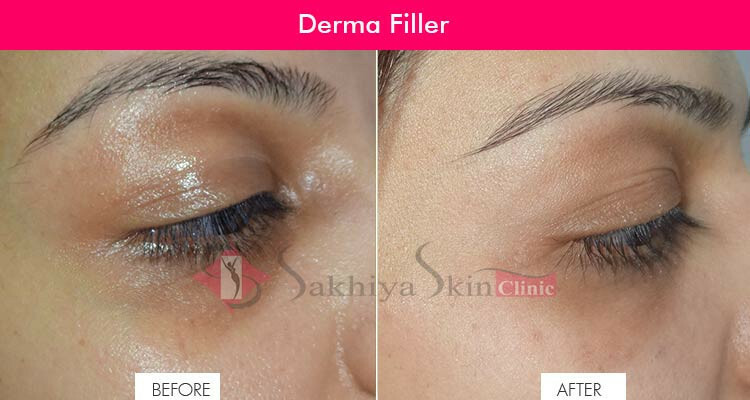 You can avail affordable Dermal Fillers Cost in Mumbai at Sakhiya Clinic. High range of dermal filler products is used for this treatment. The product is selected according to the area of skin to be treated. After cleansing a cream is applied to the skin. An ultra-fine needle is used to inject into the skin. This process helps your skin to plump up and look smoother and younger. Also, you can find affordable Filler Injections Treatment in Mumbai. Get a charming and lovely appearance especially with apt treatment for Lip Filler in Mumbai. You can get back to your work easily after the treatment it will get very less time to recover. You will feel some swelling on your face but soon it will be normal. Keep your skin clean and don’t rub it after the treatment. Sometimes it may cause bleeding and redness. Swelling may cause over the injection area. May cause bacterial and viral infection. It can also cause allergic reaction on your face. Itching may occur on the skin which makes irritation to your skin. Dermal Fillers are a group of gel substances which are used in facial aesthetics to contour, add volume or plump up areas where wrinkles and folds have appeared due to aging or scarring.